In the scenario that the two ions have the same charge, the smaller particle has less friction during movement and therefore will have a faster migration rate. In the alternative scenario that the two ions are the same size, the one with the greater charge will have a faster migration rate. There are six different types of HPCE and in the deltaDOT system both CGE and CZE are utilised. 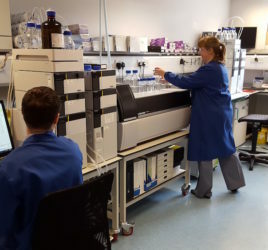 The deltaDOT HPCE system is different to other CE systems because it has a patented multipoint detection system with 512 detection points each sampling at around 20 cycles per second which track the passage of biomolecule bands across the detection window. Conventional CE systems only use single point detection. The big disadvantage of these single-detector instruments is that they are unable to differentiate between desired and undesired effects such as extraneous interference, electrical noise and light source fluctuations. The system used in deltaDOT HPCE has the ability to distinguish between signals which relate to the sample and which do not, removing any potential for inaccuracies. HPCE instruments also have a significantly greater discovery power than conventional CE systems without the use of molecular labels. A couple of combined factors allow this to be the case: the substantially enhanced resolution, sensitivity and quantification of the instrument alongside the digital output of data being delivered as clearly resolved separations. A recent study carried out by LGC illustrated that the deltaDOT system has the ability to resolve peaks of very similar mass-to-charge ratio and produce data comparable to a mass spectrometer. 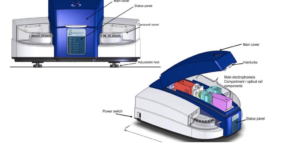 This capability to use deltaDOT’s CE system as an alternative has economical benefits – mass spectrometers can cost 4 times more to purchase and have an annual running cost of greater than 10 times that of the deltaDOT HPCE instrument.